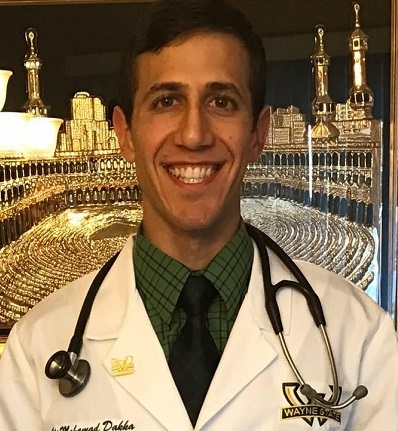 The American Academy of Neurology has awarded Wayne State University School of Medicine student Ali Dakka a travel scholarship to attend the academy's annual meeting next May in Philadelphia. Dakka, a second-year medical student, has both a professional and personal connection to the field of neurology. This past summer, his father was diagnosed with Parkinson's disease, a neurological disorder. Dakka also recently completed a research project regarding the effects of growth hormone replacement therapy on patients who have suffered traumatic brain injuries and have growth hormone deficiency. In his award application essay, Dakka wrote about how his research is helping his father deal with some of the physical aspects of his recent diagnosis. "I made it a goal to help my dad manage his symptoms as much as possible in addition to his aching back and legs from a previous injury," he said. "When I was recently studying the material for my school's Pharmacology course, I came across the results of a study that demonstrated that cycling can improve the symptoms of Parkinson's disease. As soon as I read that and further looked into it, I began motivating my father to use an exercise bike at the gym as much as he can. My father's diagnosis has stimulated me to remain aware of new research constantly done in the neurological field." The Medical Student Experience at the Annual Meeting Scholarship will cover Dakka's registration fee, travel, lodging and any related expenses. He will also receive acknowledgement at the Medical Student Symposium portion of the meeting, and opportunities for mentorship. The scholarships are supported in part by an educational grant from the Conrad N. Hilton Foundation. "I am very excited to partake in this experience," Dakka said. "I have enjoyed being exposed to both the medical and research facets of neurology. I believe that this experience will help me gain some insight into new advancements in the field of neurology, and I look forward to attending."